Fig.1. 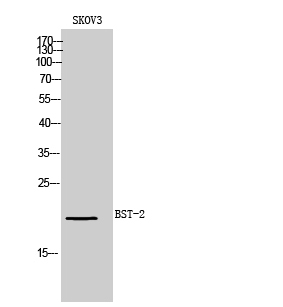 Western Blot analysis of SKOV3 cells using BST-2 Polyclonal Antibody. Secondary antibody (catalog#: A21020) was diluted at 1:20000. Fig.2. 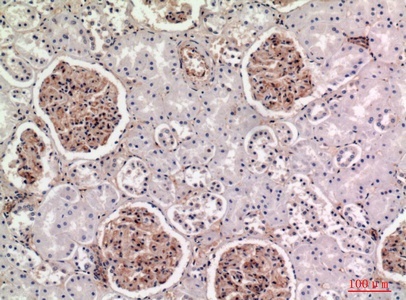 Immunohistochemical analysis of paraffin-embedded human-kidney, antibody was diluted at 1:100. Bone marrow stromal cells are involved in the growth and development of B-cells. The specific function of the protein encoded by the bone marrow stromal cell antigen 2 is undetermined; however, this protein may play a role in pre-B-cell growth and in rheumatoid arthritis. BST-2 Polyclonal Antibody detects endogenous levels of BST-2 protein.